Foliage: 3 to 5" light gray green foliage; underside of leaf is blue-white to silvery. Alternate, simple, narrow elliptical, 3 to 5 inches long, entire margin. Often has multiple trunks. Leaves are semi-evergreen; in the south they are evergreen. Flower: 2 to 3" creamy white flowers with lemon scent from late spring to late summer; bright red seeds. Flowers late May to early July; fruits early August into October. Habitat: Common in swampy thickets throughout our region; most abundant in the Pine barrens, but also found in other districts as well. Misc. 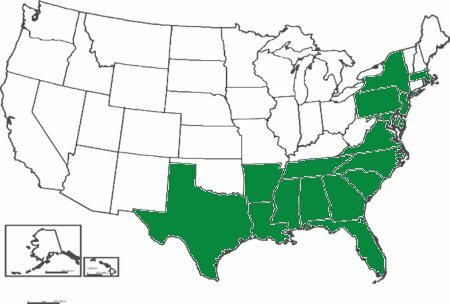 USDA lists as FACW+; i.e., Usually occurs in wetlands (estimated probability 67%-99%), but occasionally found in non-wetlands. Witmer Stone, 1910, writes: "Unlike most of the cultivated magnolias, it is a late bloomer, the flowers appearing in June when the leaves are fully developed. 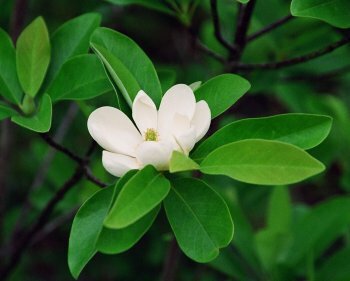 At that season the atmosphere of the Pine Barren swamps is heavy with the perfume of the Magnolia, and we recognize its presence long before we detect the creamy cup-shaped flowers nestling among the shining leaves. As the wind stirs the foliage, the glaucous under surfaces are turned up and show conspicuously against the general green tone of the swamp vegetation, and later on the bright red seeds bursting forth from the cone-like receptacle, or hanging from it by slender threads, make the Magnolia equally conspicuous. "Unfortunately Magnolia flowers have a market value, and the curbstone flower-venders of Philadelphia ruthlessly strip them from the trees, often breaking the latter to sujch an extent as to permanently ruin them. To become saleable it seems that the leaves must be plucked off and the flowers tied closely together in a compact mass, some of the leaves being then fastened around the outside in a sort of halo, this 'artistic' arrangement proving more satisfactory to both buyer and seller than that which nature found desirable. A similar arrangement is seen in the bunches of Arbutus offered for sale earlier in the season, some of which are further embellished with a head of Helonias as a centerpiece." Sweetbay is also a favorite food of deer. Deer browse the leaves and twigs all year. The seeds are a favorite food of gray squirrels and are eaten to a lesser extent by white-footed mice, wild turkey, quail, and songbirds. 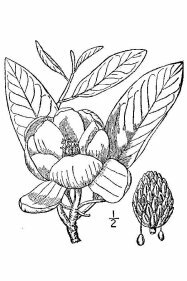 In 1688, Magnolia virginiana was the first magnolia introduced to Europe, though Magnolias also grew in Asia. Taxonomists named magnolias in memory of Pierre Magnol, a professor of botany and medicine and director of the the botanic garden at Montpellier, France, in the early 18th century. The twigs and leaves were used in a decoction for fevers and colds. Magnolia, Named for Pierre Magnol, 17th century French botanist; virginiana, of or from Virginia.